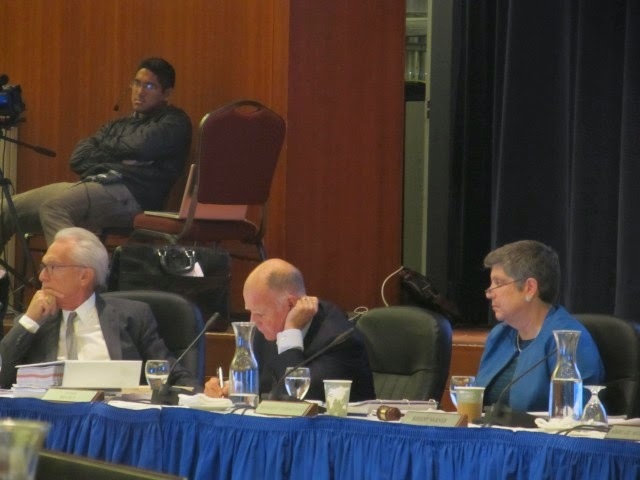 The November UC Regents meeting featured a battle of the paradigms between administrative and student accounts of student finances. California students from families with annual incomes under $80,000 will continue to have tuition and fees fully covered by financial aid, and the vast majority of California students from families earning less than $150,000 a year will see no increase. Upping the volume on this message, the immediate past chancellor of UC Berkeley, Robert Birgeneau, claimed that this high financial aid depends on high tuition, so that "frozen tuition means ever-increasing debt for low-income students." While senior managers focused on tuition, students focused on their total cost of attendance. This is what they have to pay overall while they are in school. Grants can cover most or all of their tuition, and yet rent, food, transportation, health insurance, etc. run up the overall bill for attending UC. Regular folks watching the livestream might wonder why the officials were so soothing while the students were so distraught. The explanation is that the officials and the students were talking about two different things. Here’s a figure from a Legislative Analyst’s Office report that visualizes the experience gap in the regents’s boardroom. For this student, from a family at around the median income, the University, federal and state programs cover all tuition and some expenses. And in spite of fairly expensive aid, she is left that large blank space in the left-hand bar: nearly $10,000 to pay on her own. (Her total costs are lowballed here--as we'll see, they are closer to $35,000 at the coastal campuses). The first thing to note is that a university can say to a student, "we cover your full tuition" and still leave her scrambling to fund a gap in her grants, here of between $9000 and $10,000 per year. She will have to fill this gap either with loans or work. Second, there is an ambiguity in the terminology. You might assume "Financial Aid Award" means grants. But in fact university financial aid offices "award" loans as well. They can, in this way, reduce a student's Unmet Need to zero, but only by inducing the student to borrow and/or take on additional work. They can also include parental borrowing in the closing of Unmet Need. I will follow what I believe is UC practice is calling the mixture of loans and work the student's Self-Help Expectation. Unmet Need seems like a more rigorous term to describe financial need that is not covered by grants, but this is apparently not how UC uses the term so I will avoid it. Next, where does the financial aid system expect her to get this money? 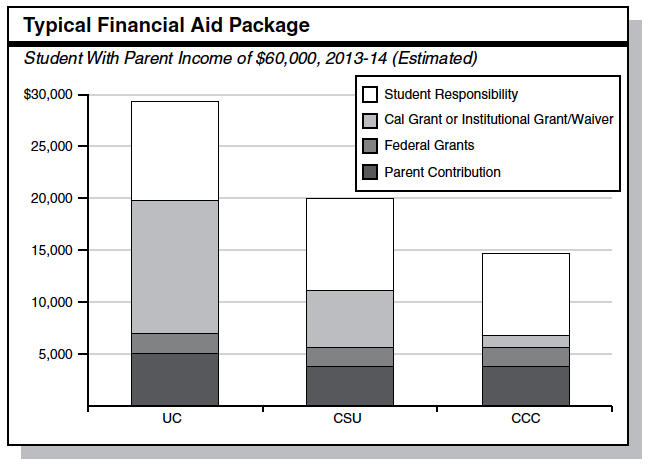 I've spent quite a bit of time with financial aid analyses, but like most UC faculty have not done concrete aid calculations for particular students. I got some help from an employee of UCSB's financial aid office, who was nice enough to send me some examples and comments. This person created the examples below without disclosing the campus's financial aid "parameters," which are apparently confidential. All of these examples presume a family of 4 with one student in college and no assets, savings, or non-salary income. It also assumes the student does not have outside scholarships. Here is the cost of attendance (COA) for UCSB. Tuition is about one-third of total costs, which are close to $35,000 a year. A student can save about $4000 by moving off-campus, putting off-campus COA at $31,000. 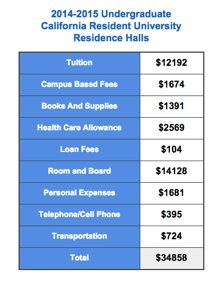 I will stick with the on-campus first-year student: how does she cover these costs? Example 1: Total Family Income = $35,000. The student's COA is $34,858. Her EFC is $0, so her Financial Need is also $34,858. Her grant total is $25,658. She is left with a Self-Help Expectation of $9200. She can supply $2000 of that with a work-study job. She needs still to come up with $7200 on top of that. This award letter has her borrowing the entire $7200 from three sources. Four years of this borrowing gets her a debt of $28,800. (In practice, annual loan offerings vary and generally increase each year, so $7200+ $6500+ $7500 +$7500 yields $28,700 after four years.) If she took a second job to avoid taking on half of the loan--by earning $3600 per year--and she worked two eight hour days per week at $10 / hr take-home pay, she would need to work 24 weeks a year while graduating with $14,400 in loans. If you look at the charts of both UC Berkeley borrowing and national borrowing in my post "Free Speech and a Free UC," you can see that this is a conservative estimate. The average debt burden for a student in this income range is about $3000 higher than this amount. This student is no longer likely to receive a Pell but can still get a Cal Grant (which covers full tuition). His COA is the same as the first student's, $34,858. His family is supposed to kick in an EFC of $7820, so his Financial Need is $27,038 per year. His grant total is $17,838. He has a Self-Help Expectation of $9200. Interestingly, this is the same expectation as low-income Student 1's. Student 2 is not eligible for work study. His parents are eligible for PLUS loans, however, and together with his $5500 in loan eligibility, this financial aid award letter has the student and his family borrowing to cover both the EFC and his Unmet Need. Assuming his loan amounts increase and he accepts the maximum in each case, the total borrowing for Student 2 is $5500 + $6500 + $7500 + $7500. Four years of that will leave the student with $27,000 in debt for a bachelor's degree. He could avoid $6800 in loan debt by working the same 16 hour weeks during most of the school year, or avoid all of it with many more hours of summer work. He could also avoid $4000 in expenses each year by living off-campus. But if he wants to spend work hours on studying, as critiques of reduced student study time like Academically Adrift are asking students to do (my LARB review offers background on this issue), he and his family together will have borrowed $27,000 + $46,080 for a joint total of $73,080 for his bachelor's degree. This student's family income is more than 150% of median family income in California. She has a kind of "middle class scholarship" in the form of the UCSB grant. It runs slightly higher than that for the student with $70,000 in family income. But she is eligible neither for the Pell nor the Cal Grant. Her family EFC is $19,760, so she has a Financial Need of $15,098 per year. Subtracting her Financial Aid Awarded ($5,898) from her Financial Need yields her a Self-Help Expectation of . . . $9200. As with Student 2, she can cover $5500 of that with her two loans, and cover the remaining $3700 with the balance of her parents' PLUS loan ($23,460 minus their EFC of $19,760 is exactly $3700). Or her parents could take out a smaller loan and she could cover the balance by working a bit more than Student 1's 16 hours a week for 24 weeks a year. To make up a third of her need [without borrowing], a student would need about 20 hours a week or more throughout the school year and that leaves very minimal time for academics and could also be a factor as to why students do not become involved in organizations or research on campus. That in turn could affect their attendance in grad school or programs like EAP. It then becomes a question of "how much can I do in one day," and what gets left out is when a student has to work it almost always ends up affecting their educational goals. Whatever she decides, Student 3 will graduate with $22,000 in loans after four years. Her parents will owe $93,840 on their PLUS loans, plus interest. The student's Self-Help Expectation is not an accident of an insufficient financial aid budget. It is built into all the calculations. The parameters appear to be structured to generate this gap of $9200 for all students, including poor students. While private colleges regularly "gap" at least their least desirable admits, say the bottom quarter, UC appears to gap all of its students. My source wrote, "I don't know the politics of the policies behind it. I just know financial aid offices are always leaving that 'gap' to be covered in loans or work." Covering a Cost of Attendance that assumes a $9200 Self-Help Expectation requires plenty of work, or debt, or both. That is true of low income students, as the aggregate data confirms. In other words, a full tuition scholarship is readily compatible with $15,000 in graduation debt. The "middle class scholarship," as implemented by a campus-based grant, produces $22,000 in debt in these calculations. 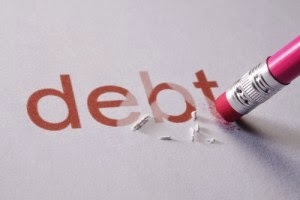 Parents are taking on new levels of debt for their children. A $100,000 family income might suggest resources to support college, and the PLUS loans promise to soak all of that up. Student 3's parents take on close to 100 percent of their annual income in loans for one child's public university B.A. degree. A special program like UC Berkeley's Middle Class Access Plan (MCAP) would reduce Student 3's parents' debt by reducing the EFC from about 20 percent of annual income in that case to a maximum of 15 percent. That would bring their debt down to $77,840. It would not affect the debt of the other two students. Parental debt doesn't seem to be reducing student debt, but to be covering tuition increases for non-poor students. The portion of tuition increases not funded by student or parent debt is funded by the state or federal governments. Here's a figure that shows one reason why the state is so angry with UCOP. 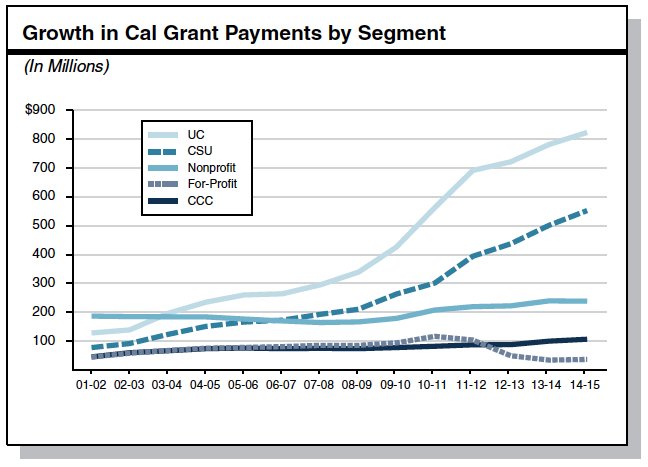 Fifteen years of tuition increases has increased Cal Grant outlays to UC by close to a factor of 8.This encourages the state to reduce its general fund outlays for UC operations by the amount that it has to increase Cal Grant outlays. Gov. Brown has in fact already told the regents that Sacramento is putting money into student scholarships instead of making "a direct investment in the university." (For further reading, see Katy Murphy's good overview of the issue). Health insurance costs seem very high for this generally young population. So does on-campus housing, which costs $4000 a year more than housing furnished by famously price-gouging Isla Vista landlords (a different cost estimate for off-campus housing is here). Student costs may be artificially increased if campuses are using on-campus housing as a profit center to generate cross-subsidies for other activities. In short, in the clash between official reassurances and student anguish about tuition hikes, the students are right. Covering Cost of Attendance has work, stress, and debt built into it. Putting the point more harshly, the high tuition / high financial aid system functions is a debt engine. Frozen tuition means "ever-increasing debt," in Prof. Birgeneau's terms. But so does increased tuition. The current financial aid system is structured to translate both higher tuition and higher financial "aid" into higher debt. Finally it wasn't about the money today but about the decline in quality. And it was the students who explained the core issue as getting affordable quality in their education. Left: Felicia Garcia, Julian Mariano, and Kimmy Tran at UC Davis. Photo credit: Paul Kitagaki, Jr, AP). The regents seemed to hear the quality message loud and clear. The problem is that almost no one thinks UC would direct new state money straight to education, as opposed to another new business scheme. When the Regents' Committee on Long-Range Planning voted 7-2 to forward the 5-year, 5 percent annual tuition hike proposal to the full Board of Regents, they faced stone opposition from the elected officials and the students in the room. The only good outcome in the renewed UC Tuition Wars will be a state buyout of the planned tuition increase (Stability Plan here). That would mean the planned 4 percent increase in state funding plus the proposed 5 percent in tuition. This works out roughly to a 9 percent increase in state funding (figures here), and another year of frozen tuition. But Gov. Jerry Brown made pretty clear that he won't go for both. And his Deputy Director of Finance, D.J. Palmer, confirmed that the tuition hike could void the 4 percent state hike, leaving a net 1 percent increase in UC revenues for next year. This evening, UCOP's EVP for Business Operations Nathan Brostrom said that discussions will continue. Earlier in the day, the Speaker Toni Atkins proposed a version of a tuition buyout with a lower state increase and many conditions. When Gov. Jerry Brown announced in committee that he would vote against the tuition hike, he also requested a selected committee to consider a five-point plan for fixing UC, which involve three-year degrees, a "wide range of online courses enrolling large numbers of students far beyond the capacity of any seat-based classroom," and program consolidation among the campuses. In effect, Gov. Brown restarted parts of the UC Commission on the Future, and negotiations on those issue would go on for years. Then the non-gov regents started firing back. I have never heard them so frustrated and openly disgusted with the state. When Regent-designate Pérez called the tuition hike proposal a kind of hostage-taking of students, he produced remarkable denunciations of state policy from Regent Reiss and of leadership defaults from student Regent Saifuddin. My storify record is here--it's been the best Regents TV in quite some time, and is getting closer to the real issue of how public universities under incessant austerity are supposed to support their historic mission of mass quality. So: why a 9 percent increase? Because it's closer to what UC actually needs to close its structural deficit. UCOP's estimates have varied and the situation continues to change, but the clearest quantification of the remedy was in a March 2011 budget presentation in which UCOP estimated it needed many years of 12.4 percent per year from the state just to close the deficit that had been created by the massive Schwarzenegger-Brown cuts (Display 46). Here's the graphic, measuring impact on the deficit not the amount of increase. This suggests a need for 16 percent annual increases when tuition and state funds are combined. Alternative C is more or less the Gov. Brown plan -- 4 percent state increases with frozen tuition. The situation today, three and a half years later, has gotten worse. On KQED's Forum, Mr. Palmer, agreed that the governor's plan in effect restored about half of the recession's billion dollar cut over a four year period. 9 percent is better than 1, 4, or 5 percent, but it still isn't enough for solvency, much less "greatness." UC constituents have unfortunately failed to endorse a funding reboot of the needed size. Academic Senate chair Mary Gilly signed on to the tuition hikes but not to a full restoration, and as far as I can tell neither the Associated Students nor various unions are calling for full state funding either. A major exception is the UC Council of Faculty Associations (CUCFA), which is recommending a complete reset of UC and CSU funding to 2000-01 levels. This would put state funding and tuition back to trend ($4,717 for UC). Professor James Vernon, the co-chair of the Berkeley Faculty Association, made the case in the Sacramento Bee, which is based on a straightforward calculation. One of the authors of the calculation, UCSF professor of medicine Stanton Glantz, appeared at the regents' meeting to call for the reset. He declared, "You should not be arguing how much to raise tuition, but how to mobilize the public support to restore the California Master plan of low cost high quality higher education for all." The reset is cheap-- $50 a year for the median taxpayer, or $384.30 extra for someone making between $100,000 and $150,000 and whose child will be borrowing fifteen times that figure each year they are at UC. Given their desperate money worries, why wouldn't UCOP endorse a version of the reset? Why wouldn't everybody else at UC? All the energy is going into blocking tuition hikes rather than into setting specific funding goals for Sacramento. Some of the problem is a kind collective fatigue, if not depression. UC leaders don't think the reset is politically realistic, which is a self-fulfilling prophecy. On the other hand, few people think the governor, the legislature, UCOP, the regents, or the public are ever going to make things right. Most of us who work at UC, CSU and the CCC have become unconsciously resigned to doing crisis management for the rest of our lives in semi-distraction from our higher-level work. Some of the problem is that the campuses don't like or trust UCOP any more than Sacramento does. UCOP has become a kind of "third force," as UCI professor Rei Terada put it at Reclaim UC. It didn't help itself with what many people, from student leaders to the Lt. Governor of the state, described as a secretive process. During a particularly good four-way discussion on KQED's Forum earlier this week, Mr. Palmer and Associated Students president Kevin Sabo shared identical complaints about UCOP's failure to develop the tuition proposals in partnership with them (Mr. Sabo at 18'; Mr. Palmer at 26'). Mr. Palmer said UC had failed to comply with the provisions of AB 970, which requires public notice and consolation around tuition increases. UCOP is apparently resisting the calculation of undergraduate degree costs as required by AB 94, whose deadline was missed. Throw in general resentment about executive compensation and recent increases of over 20 percent in some chancellors' salaries, and everyone has a reason to cut off their UCOP nose to spite their budgetary face. What state leaders should be figuring out is not how to diminish UC's role, but how to preserve UC as a national example of great public higher education. That is not what state leaders are doing. Regent-designate Oakley spoke at a recent forum about PPIC's ongoing concerns about workforce shortages, and the whole event suggested the focus of the state's establishment to be workforce training. Lt. Gov. Newsom called for a fuller integration of the three segments in a way that would facilitate this, and Gov. Brown's proposals aim at the same thing. Five years of five-percent tuition increases will merely make UC a more expensive pipeline segment. The main effect of the new tuition wars will more shrinking not so much of ambition, which is obviously alive and well in UC students, but of the financial means of achieving them. We're in year six of the official mediocrity threat, so it's not to soon for this to get everyone's undivided attention. We did get confirmation today on at least two of the preconditions for any real movement that Michael identified last week. One is the full re-engagement of the faculty, tenure track and non-tenure track, in defining and explaining the academic functions of the university. What does research do for undergraduates? Why do graduate students do? What is research? Why does it cost so much? Why, really, do we need it? What, concretely, are the activities involved in being a "premier research university." UCOP and the regents can't answer these kinds of questions. But if faculty don't answer them now, the funding situation will never change, and the workforce mission will take over. Second, UCOP will need to comply with AB 94, and account for the costs of undergraduate teaching, graduate education, various kinds of research, and administration. EVP Brostrom excused the delay again tonight, but Sacramento obviously isn't going to budge unless it gets real answers on costs that most political leaders believe are still way too high. Tearing off the band-aids wasn't pleasant, but at least now everyone sees the wounds. I thought that I would post links to some of the key documents and proposals from this week's Regents' meeting so that people would have easier access. I am simply using the titles that they are providing (no editorial commentary involved). If people have questions or comments please feel free to use the comments on this post to have an open discussion. As you have no doubt seen, UC and Sacramento have already begun the public relations war over UCOP's proposal to hike tuition up to 5% a year over the next 5 years. President Napolitano and Chair Varner took to the appropriately named "Soapbox" section of the Sacramento Bee to try to justify their plan. If they hoped to win over the Governor, Sacramento, or students, their efforts clearly failed. As both the LAT and the Sacramento Bee are reporting, opposition is already intense and the Governor's office is suggesting that the State may lower proposed funding increases if UC increases tuition. The LAT has more on the long debate ahead. First off let's admit that there is a problem. UC's costs are going up and recent small increases in state funding neither make up for previous deep cuts nor keep pace with the costs of supporting undergraduate education or sustaining graduate training and research infrastructure. State General Fund funding in 2014-15 ($2,990,671,000) (in nominal dollars) will still be lower than it was in 2007-08 ($3,273,917,000). This despite an increase of nearly 20,000 state residents on the general campuses. For too long time the amount of money the state contributes per student has been in decline. Now it should be clear that this is not an acceptable situation. The question is how to get out of it. Jerry Brown argues that 4% increases combined with some cuts and the magic of online classes is enough. But Brown's support for online is symptomatic of a fundamental mistake: the notion that the rising costs relate primarily to undergraduate instruction. Between increased class sizes and greater use of contingent faculty UC has been lowering the cost of undergraduate education for years. In fact, upgrades to technology have increased costs, as has expansion of student services that help the full range of students complete their degrees (something dear to the heart of Brown's accountability regime). But these costs will not be lowered by online education which, if done well, will increase costs at least in the short run. Brown's position seems to be simply a continuation of his life-long mantra of austerity for its own sake. UCOP wants to take the 4% from the state and then add a 5% tuition hike onto students, while also maintaining the current high level of non-resident students (or even increasing them). 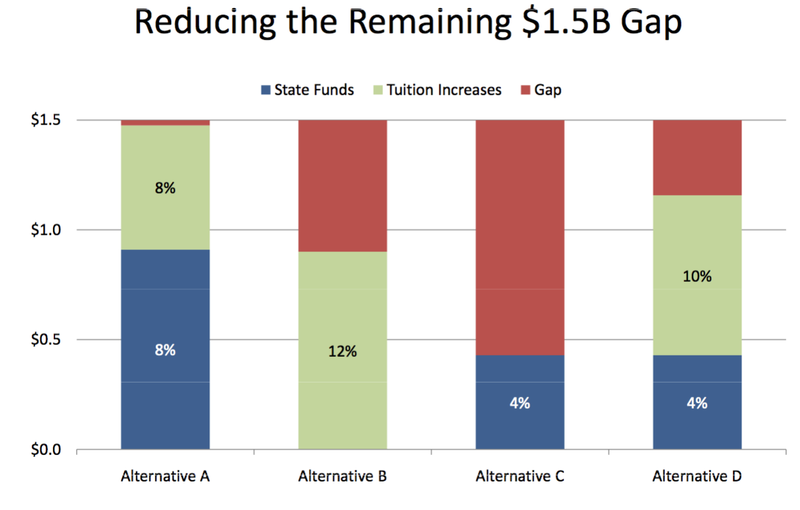 It is important to recognize the assumption that state increases will continue: although most of the discussion and argument has been about the 5% figure UCOP's proposal actually leaves open the possibility of up to a 9% tuition increase if the Governor follows through on his insistence that he will only allow General Fund increases if tuition remains frozen. I am not sure if UCOP simply fumbled the roll-out (so that now the university will look even worse if it tries to increase tuition by more than 5%) or if it was trying to pin down the state. But whatever the explanation, the possibility of further overburdening students is real. Neither strategy makes long term sense for the State or the University or especially the University's students. Let me start with the University's because that is simpler. The University has been committed for many years to a high tuition/somewhat higher aid model. Although the credit agencies prefer to have universities rely on tuition as opposed to state funding, the main argument for the model goes something like this: given the existence of return to aid for in-state resident tuition (but not NRT) it only serves the wealthier students to hold tuition down because financial aid pays the tuition of lower income students. What this argument overlooks is that the rise in tuition means that other funds (like Pell grants) that might have been used to cover non-tuition expenses will be diverted into tuition and that students will end up working longer hours and therefore taking more time to degree. (Look for instance at "Sonja's" case here.) I don't know of anyone who has has a way to calculate the number of potential low-income students who were discouraged from applying because of rising tuition and prices, but I doubt it is zero (although UC's figures suggest that the percentage of low income students did not decline in the years leading up to 2012-13 which is the last year that I could find figures for). And UC acknowledges that the amount of debt taken on by students has risen in recent years. (Figures 1-15 and 1-25) Chris has laid out the case against this model in this post. Not only is UC's strategy bad for students but it is bad for the University. Although the Governor likes to point out that UC's rise in tuition has more than compensated for the gross losses in state funding that overlooks the reality of the way that financial aid works. As Bob Samuels points out in his own dissection of the UC tuition proposal, the net revenue from tuition is still below that provided by the State because 1/3 of in-state tuition goes to return-to-aid. In fact, the latest proposal only intensifies the long-standing error on the part of UCOP of insisting that they could keep securing access and quality through the high tuition/somewhat high aid model (one of a series of errors Bob identifies in his post). UC has, in effect, allowed the Governor and the LAO to begin treating student tuition as public funding. Unless UC is willing to turn its back on access and its public mission and only allow the well-off to attend the University it simply will be unable fund its way out of this situation on the backs of students and their families. Put bluntly, the present strategy does not offer a way for UC to retain its proclaimed commitments to quality, affordability, and access. Now I am not naive. As I suggested at the top of the post, the Governor is not a friendly audience for requests for increased funding. One of the uncertainties introduced by UCOP's tuition proposal is whether the Governor will insist on reducing or eliminating proposed state funding increases in response. If this happens either UC will receive little if any financial benefit from the added tuition unless it places even greater burdens upon students. But the Governor's position makes no more sense than does the University's. The problem lies in his indifference to, or ignorance of, the effects of his austerity policies. To take only the most immediate example, the Governor placed his political capital and fundraising skills to pass his rainy day fund. Unfortunately for too many Californians the storm is still ongoing. As Dan Mitchell has pointed out the latest figures for tax revenue while higher than the Governor predicted remain highly dependent on capital gains revenues; sales taxes--a better indicator of how the majority of the state's citizens are faring economically--remain low. His obsessive parsimoniousness is exactly the wrong policy at the present time. But there is a longer-term problem here. The Governor insists that the state needs a larger rainy day fund and to hold back on counter-cyclical investments because of the volatility of tax revenue. But the volatility of tax revenues is deepened by austerity because austerity deepens inequality and inequality exacerbates the volatility of revenues. Although the overall effective tax structure of California is regressive the volatility problem exists because of the state's dependence on capital gains taxes. The only long-term sustainable way to move away from that dependence is to create new ways to increase the income and opportunity for the mass of the state's population. Cutting back state investment does the exact opposite; it insures that the state will become even more unequal and dependent on capital gains income that bears a tenuous relation with the state of the real productive economy. One of the prime mechanisms for creating mass income, opportunity, and what used to be known as public happiness has been public education. In the present state of society that needs to include greater--not lesser--access to higher education through the Community Colleges, CSU, and UC. But just as it is reasonable to argue to Sacramento that it is in California's interest to reinvest in higher education to be able to break with the high tuition/somewhat high aid model it is also reasonable for Sacramento and the California public to insist that this not be done along the business as usual model proposed by UCOP. Instead, something deeper is needed. First, if UC wants to make a stronger case for increased state funding UC needs to stop insisting that even if it keeps raising tuition students will be fine. Instead, they should enter into negotiations by taking the position that what is needed is to increase state funding so that student tuition can be rolled back. UCOP cannot take the "we need more money trust us" position that it has assumed in the past. Second, UC needs to become more transparent in its budgets. As Charlie Schwartz has been arguing for decades the budgetary categories UC uses (e.g. instructional costs; student services) are simply too vague. UC's core activities are instruction and research but the University has never made a good enough case for the importance of State support for research nor have we done a good enough job in explaining why being at a research university is good for students. UC also needs to genuinely confront managerial over-expansion. UCOP likes to dismiss criticism by pointing to the relatively small amount of money that goes to senior management salaries. But that is a red herring: the real issue is that senior managers bring in their wake ever increasing administrative staffs which generate their own tasks and costs. It is the entire management ideology and structure that needs to be rethought. Third, it is time to have a serious discussion of UCOP role and structure in the contemporary moment. I am not one to call for the elimination of UCOP. I think that there are still important system-wide functions that it performs. But we have to recognize that the question of why it performs the functions it does and at such cost is something that needs to be rethought. Just to give you a sense of scale, the budget for UCOP in 2013-14 was about $587M. The budget in the same year for the Santa Cruz campus was $633.2M. Now granted, some of the UCOP budget is due to system-wide programs that happen to be sheltered under UCOP (especially agricultural programs). But do we really think that the Office of the President should have a budget nearly as large as an entire UC Campus? Finally, as part of a larger public discussion of a new Master Plan for Higher Education UC needs to move beyond the missed opportunity of the UC Commission on the Future. It is time to recognize that that effort was misconceived and wrongly organized. Under the leadership of President Yudof, Regent Gould, Senate Chair Croughan, and Dean Edley, UC pursued the wrong effort with the wrong goals: top down, administratively driven, obsessed with online education and far removed from campus life. As part of any new Master Plan UC needs to engage in a different sort of self-scrutiny: centered on faculty, staff, and the campuses; geared to re-energizing the teaching and research functions of the University, willing to mark out new ways to serve the public in realms far beyond the commodification fetish manifested in UC Ventures or Westwood Tech Transfer. To regain this sort of public investment and to renew UC's public mission is, to be sure, a long-term endeavor and one without guarantees. I think that by challenging the logic of continual cuts, President Napolitano has taken a step beyond the Eeyore like passivity of the previous administration. But more needs to be done to decide what the money is for. If faculty want to regain their role in governing the university we need to take up the challenge in alliance with parents, staff, and students. And to do that we may need to invent new forms of organization and communication. What's coming are price hikes--big ones in UC Care. (In contrast, the negative number at left is the subpar status of UC's benefits relative to market). That's the unloved UC self-insurance plan that was implemented last year over a hue-and-cry about its incomplete and inferior coverage. On Tuesday, after voting in the midterm election, I went to the Santa Barbara Senate's forum on changes this year (prices here), which revealed the obstacles to improvements going forward--both at the system level and at UCSB. 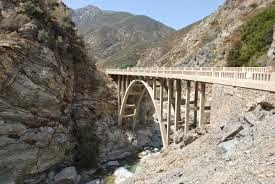 Here I'll discuss UC and UCSB together. The issue comes with a history that began last fall, with the gradual unveiling of new UC health care plans and of their various deficiencies. The specific UCSB issue was the absence of the Tier 1 version of UC Care in the Santa Barbara area, which made medical costs higher for UCSB employees than for their peers on other campuses. After UCOP officials endured a large, angry meeting on the Santa Barbara campus, a patch was arranged. Sansum Clinic would offer Tier 1 services for a year, with a possible continuation. But Cottage Hospital, the best and only full-service hospital in the Santa Barbara area, would be available exclusively under Tier-2 payment conditions for UC Care (and under normal HMO conditions for HealthNet clients). Tier-2 has much higher payments for patients, but underlying cost inequities and access problems were not resolved. On the eve of last Tuesday's Senate forum, the UCSB Faculty Association posted a statement on UC Care that itemized these ongoing inequities and problems. 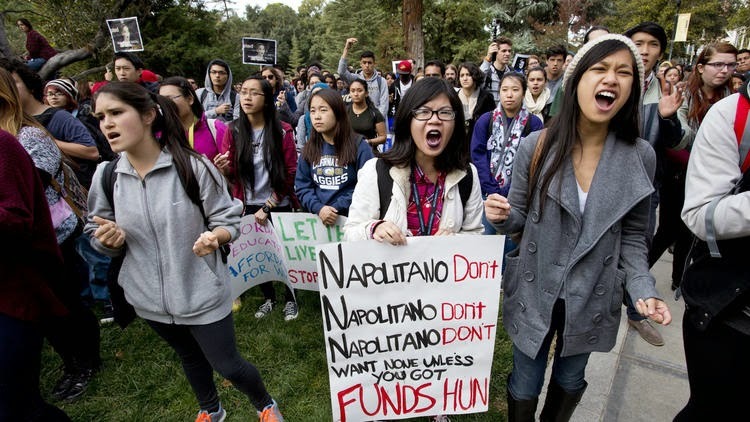 It called for Chancellor Henry Yang to appoint a committee empowered to meet with UCOP officials, including President Napolitano, in order to fix the health care plans. The goal would be for "Central Coast employees of UCSB [to] have access to quality health care on a basis that is not inferior to that at other UC campuses." UCSB FA president Nelson Lichtenstein and other FA members came to the Senate meeting with copies of the letter, and repeated the call. What are the chances of a real fix? As far as UCOP is concerned, there is nothing to fix. I say this because they declined Senate divisional chair Kum-Kum Bhavnani's invitation to send officials to speak with UCSB Senate members at the meeting, and because of a UC-wide survey their Human Resources department published in mid-October under the headline, "UC Faculty, Staff, and Retirees Satisfied with Current Medical Plan Offerings." Chair Bhavnani presented the major findings. Respondents saying they were satisfied or very satisfied with their plan, their new plan, their ability to see a primary care physician, or their ability to see a specialist, were all in the mid-70s out of a hundred. For example, "77 percent of those enrolling in a new plan said they were satisfied with the new network." Although there were early reports of prescription drug problems, satisfaction rates there hit 90 percent (slide 20). Broken down by campus, Berkeley and Los Angeles have 76 percent and 75 percent satisfaction rates. The formerly unhappy Riverside comes it at 76 percent satisfied, above the medical campuses Davis at 74 percent and Irvine at 71 percent. The only real holdout is Santa Cruz at 54 percent. Santa Barbara, the least well-served, is in between, at 67% agreeing or strongly agreeing that they are satisfied with their plan. The absence of a large dissatisfied minority may have enabled the price hikes I'll get to in a minute. In any case, the rollout appears in the survey as a major triumph. The major exception to this pattern across the system was UC Care. There, the percentage who agree/strongly agree that they are satisfied with their plan falls to 46 percent (slide 10). UC Care is off the charts in dissatisfaction with access to correct information about the plan (slide 22). In other areas UC Care is comparable, but it's obvious even in this survey that major work still needs to be done. An implied question at the forum was whether UCOP is going to set systemwide health care policy on the basis of surveys like this. My guess is yes, though that's a bad idea, partly because of the survey and partly because of the management theory behind it. First, the survey has a fairly low response rate (26 percent), in part reflecting the fact that it was administered during a two-week window that began right at the end of the academic year for eight of the ten UC campuses. Secondly, the health care system's biggest problems occurred at sites that are too small a percentage of the whole to budge the totals (the medical centers and national laboratories were included). Perhaps most seriously, the survey doesn't distinguish among levels of use, which artificially increases satisfaction rates. I pay for UC Care but didn't use it once during my first year, so would have no reason to express dissatisfaction with UC Care. The meaningful satisfaction figure is the share of active users of the plan, ideally broken down by level of use. Those numbers, if they exist, were not published. The poor management theory behind surveys is that you can manage by majority opinion and set the minority aside. That marginalizes individual experience, and in health care it is a way of favoring the healthier share of the population over the sick. This strategy produced such serious cost and public health problems with the existing private health care system in the US that the Affordable Care Act, for all its public subsidizes for private providers, now regulates it. The UC system doesn't reject sick employees, and yet this survey, normally construed, encourages UCOP to treat the dissatisfied as outliers who can be safely ignored. Those outliers include the entirety of the UCSB workforce, who constitute about 3 percent of the system's healthcare enrollment. Management by survey may have encouraged UCOP to end last year's policy of holding down employee contributions. You'll remember that UC Care's premium, defined as lower than that of Anthem/Blue Cross, was a leading selling point. I did some quick calculations before the meeting and discovered that my UC Care premiums will be rising by over 17 percent. This is of course a systemwide price. Lower income employees will see a rise of about 20 percent. In all brackets, UC Care prices rose from 2 to over 3 times the rate of HealthNet and other preexisting commercial plans. Chair Bhavnani presented a spread sheet that displayed cost increases for all plans at all income brackets, and they are disturbing. Will they be repeated for 2016 and again for 2017 and for the years after that? No one from UCOP was there to answer this or any other health care question. I asked Chair Bhavnani about UCOP's justification for UC Care price hikes that are more than double projected cost increases for the medical sector as a whole. Several people chimed in, and the leading explanations were that the UC medical centers who provide UC Care's service (a) had new costs that they had to roll forward into this year; (b) are actually not very efficient at providing primary care; and (c) have growing deficits that need covering in part from UC Care revenue streams. Of course last year UC proclaimed the readiness and superior efficiency of UC's medical centers, which were there to keep costs down. In addition, UCOP presented UC Care as a health benefit to UC's employees rather than as a way of creating a captive customer base for UC hospitals. Was the point really to pull in tens of thousands of new customers and their ever-higher premiums for a medical enterprise of dubious solvency? Nobody in the room wanted to contemplate the extent to which UC employees, faculty included, are regarded as little more than revenue sources by a UCOP that has not been candid about the fiscal problems facing one set of UC "businesses." Mid-career and younger faculty focused on the economic straightjacket facing them, and the difficulty they will have paying more (for less). On the UCSB Tier-1 issue, Samsum will participate for 2015, but the agreement ends that year and there is nothing in place to extend it. Cottage Hospital will remain outside of UC Care Tier 1. An advisor to the chancellor said he doesn't think UCOP is actively negotiating with anyone in Santa Barbara, and that he couldn't get a straight answer out of either side about where the talks are. Chair Bhavnani asked for a sense of the meeting--what did we want to see happen now? I asked that she post the price hike spread sheets on the Senate web site. (As of this writing, this has not happened.) I expressed confusion about whether the Senate wanted to mobilize faculty on this issue, or not. I also asked why we don't ask for premium reductions for UCSB's subprime version of UC Care. Someone else replied she didn't want to pay less for Tier 2 UC Care--she wanted Tier 1. A third person suggested a lawsuit, and I agreed. It's hard to think of what else would get UCOP to care enough to spend the money it would take to have the unified system we're supposed to have under standard insurance risk pooling principles. The FA's Prof. Lichtenstein suggested that if there's enough pressure to get UCOP to cover UCSB with Tier 1 UC Care at Cottage, they'll realize UC Care was a bad financial idea and scrap it. We could go back to providers that only raise rates 6.8 percent a year rather than 17 to 20. But again, where will the pressure come from? As physics professor Harry Nelson pointed out, UCOP didn't care enough to send someone back to UCSB to see how their plan is working for us. And they can shield themselves from criticism with their survey. Furthermore, the turnout for this meeting was small (I think because no one has yet really checked the year-on-year price increases). The UCSB Senate leadership in the room did not seem not interested in the lawsuits or in an official letter of protest of the ongoing inequity. Would the Senate start by endorsing the Faculty Association call for an official task force and delegation? To express your opinion, you can write Chair Bhavnani via the UCSB Senate splash page. You can also write the systemwide Senate chair, UCI professor Mary Gilly at mary.gilly@ucop.edu. The chair of the systemwide Senate's Faculty Welfare committee is UCSD professor Joel Dimsdale at jdimsdale@ucsd.edu.